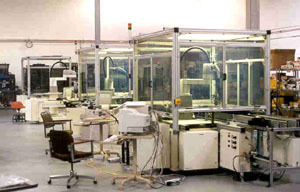 SCARA Production : Zmation, Inc.
Our goal is to make our customers more successful. If we build a system that makes our customers more profitable we benefit far more from the relationship. This is an example of a large SCARA automation platform build. This was for a repeat customer. The automation platform was modified from a previous design that we had developed for them.